with Wifi AC & Ceiling Fan. A Home In Ubud Bali. Is Private Room in Ubud, Bali, Indonesia. Villa offers spectacular views of rice fields, tropical forest and Mt. Batour. Living areas are spacious with imported ceramic floors, quality furnishings, and dramatic lighting. Bali living at its best day or night. There are sliding glass doors throughout the house for a open green space living. The swimming pool is at the edge of the fields uninterrupted by neighbors. Located in an area unspoiled by development & overcrowding, the villa is tucked away 100 meters from the road where the only sounds you’ll hear are the breeze though the garden and the waterfalls in the koi pond. This accommodation is located 8-minutes away (by scooter) from the conveniences of Ubud Center. Accommodation good for one or two adults in a Private Room. Queen bed measures 160 cm x 200 cm with soft, fluffy pillows and fresh cotton sheets. 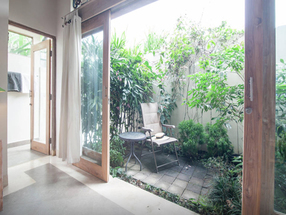 Sliding doors open into a small sitting garden with night lighting. We created the suite/apt with lots of natural light and air. It’s the perfect place to relax and dream. The spacious suite bathroom features a large skylight and decorative reproductions of Indonesian sculptures. There’s even an actual window from a Javanese Joglo. The large outdoor shower features modern fixtures including an oversized shower head with hot and cold water. 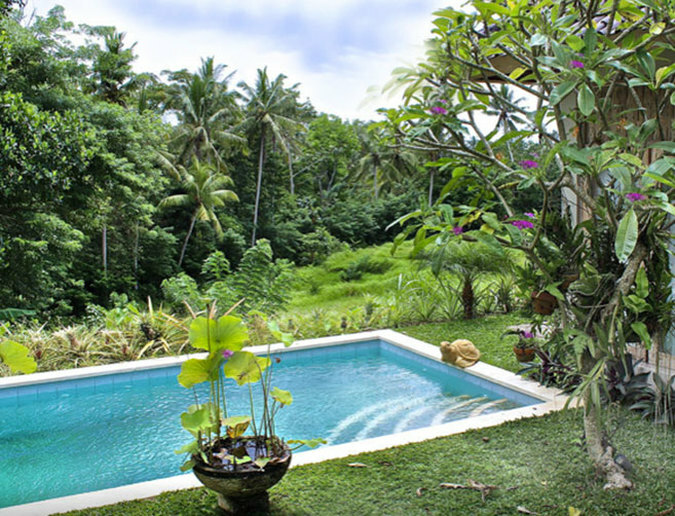 The Villa is just a scenic 8-minute ride to center of Ubud. If you want to go exploring on your own we have motorbikes available to rent. Our staff will take care of all the arrangements and give you a free ride on our bike or car into town so you know the way home. Please plan to take advantage of this between 8:30am and 1pm so you can make the most of your day. Your host has been in Bali for over 14 years so he knows where all the secret spots that have yet to be discovered by tourists. He is usually on hand to greet you and will happily provide lively conversation and advice. There are no other guests on the property. He host lives across the garden in a separate master suite. He is a textile and garment designer and he can also guide you to batik workshops, organic textile manufacturers, textile markets, wholesale fabrics and silk painters. In addition, he can help you plan a day of touring to the mountains, cooking class, batik workshop, Balinese Dance, Monkey Forest tour, Puppet Museum or anything else of interest. Airport pick-up available. Email us with flight and times. Breakfast is included and bottle water. We accept Paypal, Cash, Visa, MC, Discover. Contact Us: How can we help? Where are you traveling from? How many nights? Private Room has a Queen size bed with AC, ceiling fan and and Wifi. There are 2 small garden, sliding beveled glass doors and garden lights. Relax and Recharge! Western toilet with bidet. Javanese wooden window for light and air. Marble sink with teak cabine. Perfect for a holiday vacation! Ubud, Bali has a wonderful selection of spas and wellness centers. It is not a 3 minute walk from our Villa. Traditional Ceiling. Personal Touch for you next Holiday Vacation. Designed with detail. Teak wood beams white washed. As a former curator of museums and textile designer I am inspired by tropical colors and natural fibers. Art is everywhere in Ubud Bali. Just listen with your eyes, ears and heart. Salamet Datang! or Welcome to our holiday vacation home rental. 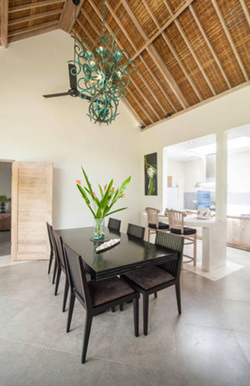 Living Room, Dinning Room and Kitchen are modern with a traditional teak Balinese white wash roof. The room is an open space with beveled sliding glass door. 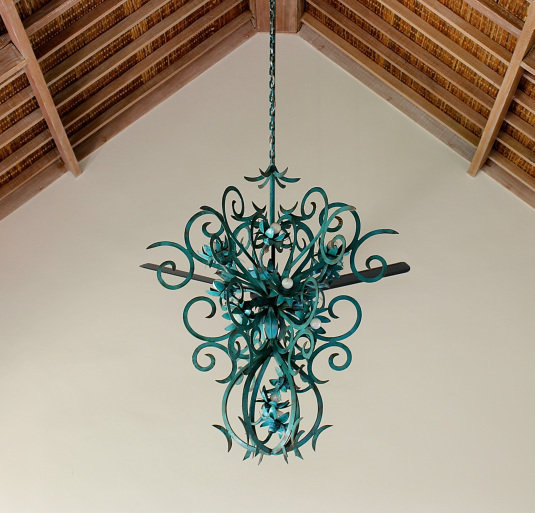 A dramatic forged iron chandelier over the dining table sets the tone. Breakfast is served from 8:30 am to 10 am. It's simple eggs, bread, fresh fruit and coffee/tea. If you like something else we are delighted to accommodate you. Kitchen with skylight. Oven, Stove & Fridge. Breakfast is include up to 2 persons. Typical resort kitchen with stove top and refridge. We can arrange to have Wayan cook you breakfast during your stay. Each morning he can buy fresh fruits at the open market. At Bali Holiday Vacation Rental we try to make your stay health and relaxing. Our accommodation can cater to all different tastes. Natural stone lines pool. Simple details are beautiful. Easy entrance into the water stone pool. Center courtyard. Looking pass the pool into the tropical forest and fields. Main house on the left. Sliding glass doors for air and light. 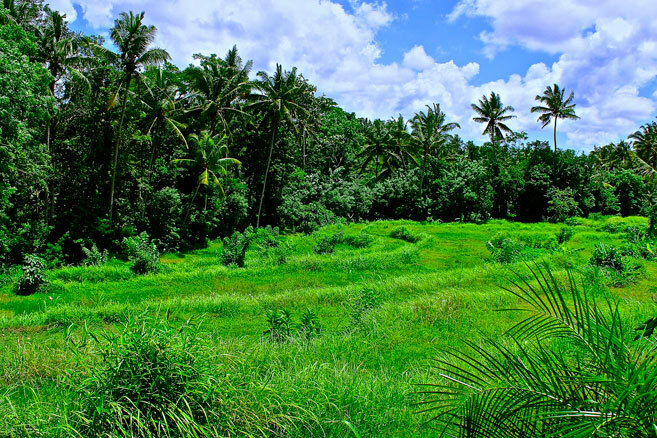 Open green space is all about Bali. Room has night table with lamps, as well as reading lights over the headboard. 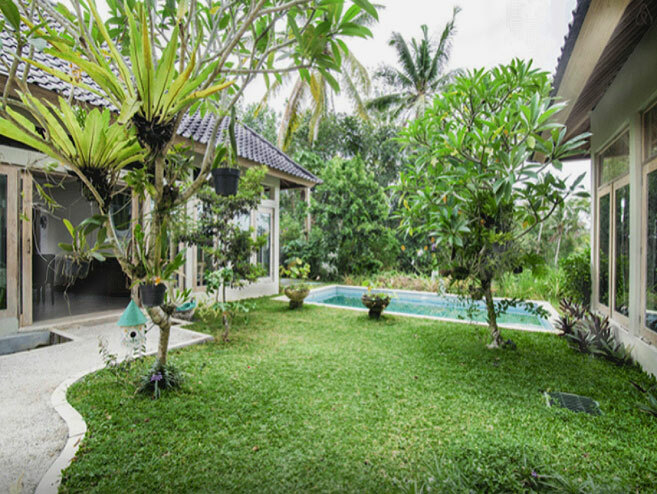 Picture Open green space of tropical forest and rice fields is the setting for this new Villa. Views from the living room, dining room, outdoor breakfast patio and pool area. Relax, Read and Recharge. 1. Is a deposit required? Yes, 50% deposit. Email us for our deposit policies during High Season. Final payment is required 30 days before check in. Payment is refundable with a 2 month notification of cancellation. 2. Is a security deposit required? Yes. Refundable if there is no damage. 3. Is there a exit cleaning fee? Yes, $25 per stay or week. 4. Is there a driver that can pick us up and take us back to the airport? Yes. 5. Is there an oven? Yes. 6. Is there bottle water to drink? Yes. We supply the first tank. 7. Is there laundry service? Yes. We will clean and change the sheets and towels once during the first 7 nights of your visit. Personal and monthly laundry can be arranged. 8. Is there a phone. No. We will offer you a phone (you just pay for time used) or you can buy a local SIM card to activate your phone. 9. Is there WiFi. Yes. 10. Does the rental include breakfast? No, but we can arrange a cook to shop and attend to your meals. 11. Is this a private home? Yes. This is not a hotel. It is private and personal. It is comfy, cozy and quiet. We hope you will love it as much as we do. 12. How close to town is the house? Most people choose to rent a motorbike or hire transport. We offer one ride into town before 12noon each day. 13. How is the electric? It is excellent, however there is a shortage on the island so please be sensitive to usage. We ask you to keep the pool on no longer than 2-3 hours a day. 14. Is there a bath tub? No. We have a wonderful outdoor shower with a full wide shower head. It is covered and private. Hot and cold shower.